Thanks to a reader Bruce for directing me to this title. As Bruce pointed out in his comment, the underwater submarine effects in this film are wholly depicted by computer graphics, however there are a couple of surfacing shots that are done with a miniature in a tank. Fantasy Film Effects are credited with the tank work and they had a tank in Sun Valley California which was subsequently closed in 2014. ML: Your expertise is submarine stuff, though, right? 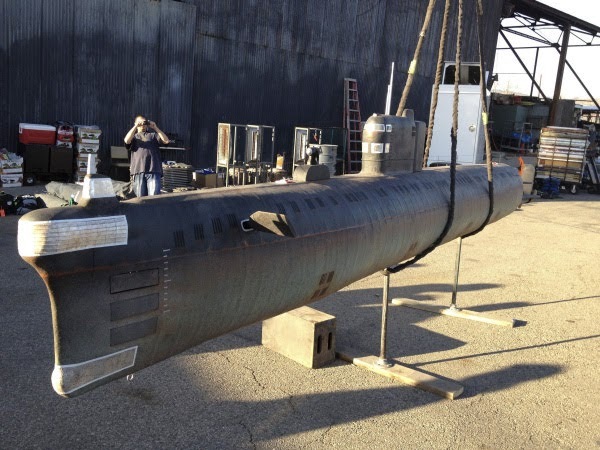 KS: When it turned out the special effects were going to be a little too pricey, I built a 23-foot model of the sub in my garage in Ohio and brought it to Burbank. I got the plans for the Foxtrot sub, and I built it to scale. They said, "Can you just build a 10-foot model?" but I said, "No. You can't make a water droplet any smaller than it is, and you can't make a wake any smaller than it is. All you can do [to keep scale] is make the model bigger." It's what you see on the poster. It cost just $23,000 to build and ship over, which meant we had a lot more money to spend on special effects. I wanted to build a 50-foot sub that you could put a man in and put it in the ocean. But directors like to shoot in tanks - conditions where they can control everything. I was going to build a November-class sub, too, but time was against us. ML: All in your garage? KS: It's got a wood keel made with 2x6s. I cut the ribs from three-quarter-inch plywood. Then we took 5 mil plywood and cut strips for the hull. We laid them laterally, so they looked like plates. I sat down and watched every submarine movie before I built the thing, and every model that they use looks like it's brand new, like the first sub I was on when I was in the Navy. But if you look at the hull of the sub in the Maritime Museum, it looks like crap. The pressure of the water bends the plates - they're made to bend. We laid the plywood, filled in the gaps with wood putty, then wrapped wire around the sub to mimic the appearance of the ribs [between the plates]. Then I coated it with fiberglass, like you put on a boat. Finally, we textured the hull and painted it. My son helped me; he's an artist, too. ML: So much for the exterior. KS: Inside, I put trolling motors in with extended shafts for the propellers. And I had ballast tanks with valves. We had remote controls to open the valve so the sub would sink, and then to close the valve and blow air so that the sub would rise. I drove it two-and-a-half days from Ohio to Burbank, the Fantasy II Film Effects studio. The place was like a Hollywood junkyard. There was a million-gallon pool in the back, and a big warehouse with all these props from the movies lying around. They had a couple of wooden shelves in this old, ratty office, on them were two Oscars, an Emmy, and three Saturns. They're covered with dust, and the guys says, "My grandpa won this Oscar for The Time Machine, and my dad won that Oscar for The Terminator." I'm in a corner of the shop putting things together, and there's this Terminator-bot. It's ten feet tall in the movie, but it was really just four feet tall, and it was just sitting there. ML: So you built the sub. KS: I also built two half-scale torpedoes torpedoes with motors. And I've been a diver since '65, so I worked in the pool to catch them after they got launched. There would be this fog of water, and all of a sudden this thing would be coming at me. We'd catch it and it would force us back six feet, and we'd stop it. It was spooky; I never got used to it. We also had to build torpedoes from cardboard for the torpedo room. When we got down here, we found the sub had only one torpedo! So I sketched one and called my son. We put a prop on it from one of the old boats in the museum, and we decided to leave them in the tubes after shooting was done. ML: Is there anything you didn't do? KS: I got the nickname "The Dos Equis Man" during the shooting. I was working with the sub, doing the models, helping with directing...But the whole movie industry is nuttier than a fruitcake. Think about this: you want to buy a car from me. I say, "Fine," and I build a factory, hire people, build one car, give it to you, and then shut everything down. That's why movies cost what they do. ML: What was cool about the project? KS: This was the first submarine film actually shot inside a sub, because digital cameras are small enough now, and because we can manipulate the image in post-production. We brought a lot of attention to detail to the project to get it to where it was really accurate and a little gritty. Usually, the inside looks too clean and well-lit. From watching the movie I got the impression that all the torpedo shots were CG so whatever footage was shot with miniature torpedoes didn't look like it made it into the movie. Even the miniature submarine shots are pretty minimal for what appears to be a decent sized model. Fantasy II Film effects are very experienced at miniature photography and particularly with water effects. I can only imagine there must have been some budgetary issues involved or the production had the typical preference for CG over miniatures.